Our store stands only a stone throw away from the childhood home of the world famous designer Gianni Versace. Twenty-five years ago, Italian fashion powerhouse Versace decided to look beyond what one wore, to how one lived through objects that would give one’s personal space its intangible, iconic aesthetic design. Versace began with a line of home textiles and followed it up with a range of fine porcelain dinner sets that resulted from a long-term collaboration with German chinaware maker Rosenthal. Beauty and perfection of the highest standards, Rosenthal signifies nothing more and nothing less. The name itself epitomizes contemporary design and art in both porcelain and glass. Rosenthal stands for luxury, lifestyle and a special aesthetic feeling. A sense of tradition coupled with the avant-garde is the underlying principle behind the worldwide leading porcelain company. Experience gathered over 130 years of company history. 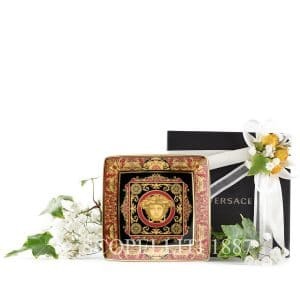 Hence Versace and Rosenthal, two brands synonymous of excellence and high quality blend together creating sublime luxury. Rosenthal, icon of German tradition and innovation, has an international reputation for fine and simple craftsmanship, while Versace, the extravagant Italian Fashion House, has its own world famous and glamorous style where it brings together the historical and the ultra-modern, to arrive at timeless yet totally contemporary designs. Together they have developed elegant, refined and exciting tableware and gift collections. Inspiration derives from different historical periods and cultures. The baroque aesthetics and the Versace’s luxurious richness of the Medusa Gala decòr enriches even further the glamorous Rosenthal Versace collections dedicated to the mythological creature. The Medusa becomes extremely elegant and refined against the dazzling white porcelain background enveloped by the gilded filigree and intricate baroque ornaments. The collection is a bit subdued in terms of colour featuring an ornate pale grey and white pattern with or without gold accents. According to ancient myths Medusa was one of the three Gorgons which in Greek mythology were sea monsters with gold wings, snakes for hair, and turned anyone who looked directly at them to stone. The three sisters represented perversion in its three individual forms: intellectual, sexual and moral. Medusa’s snake hair locks were a punishment from Athena. The once extremely beautiful mortal was punished by Athena with a hideous appearance and loathsome snakes for having been raped in Athena's temple by Poseidon. Gianni Versace chose this Greek mythological figure as his luxurious logo because she made people fall in love with her and they had no way back. He hoped his Maison would have the same seductive effect on people. 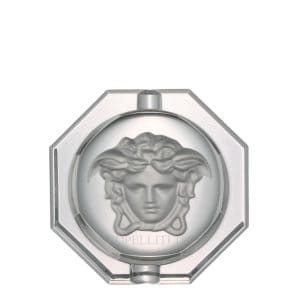 Indeed the sumptuous Medusa head is the protagonist of many Versace collections in different rich colours and refined details making them unique and highly desirable among Versace cult followers. The Medusa Gala is ideal for those who wish to bring home the magnificence of gold combined to the sophistication of the Versace patterns ideal for gala dinners as the name inspires. The “Medusa Gala Gold” line, adorned with a full-faced gold plume and ribbon motif, is even more luxurious. Medusa – Ikarus, one of the first dinnerware collections of "Rosenthal meets Versace”, launched in 1993, mirrors the matchless rich, colour intensive world of Versace. The emblematic Versace pattern featuring the glorious gold coloured central Medusa head has a new contemporary look. The new form lends excitement to this classic pattern. Beautiful detail and vibrant colour of the expressive baroque ornaments make this a true must have. The pulsating brilliance of the deep red, the elegance of the black and the magnificence of the gold: a colour spectrum which dominates the Medusa collection. The collection was Designed by Paul Wunderlich a German internationally known lithographic and object surrealist artist. His works are characterised by magic and mysticism and by the use of precious materials such as porcelain. Wunderlich had been working for Rosenthal since 1978. According to ancient myths Medusa was one of the three Gorgons which in Greek mythology were sea monsters with gold wings, snakes for hair, and turned anyone who looked directly at them to stone. The three sisters represented perversion in its three individual forms: intellectual, sexual and moral. Medusa’s snake hair locks were a punishment from Athena. The once extremely beautiful mortal was punished by Athena with a hideous appearance and loathsome snakes for having been raped in Athena's temple by Poseidon. Gianni Versace chose this Greek mythological figure as his luxurious logo because she made people fall in love with her and they had no way back. He hoped his Maison would have the same seductive effect on people. 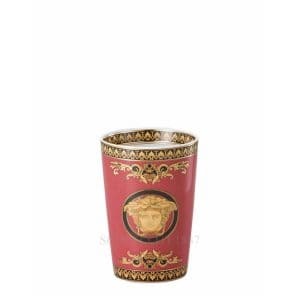 Indeed the sumptuous Medusa head is the protagonist of many Versace collections in different rich colours and refined details making them unique and highly desirable among Versace cult followers. Medusa – Ikarus, one of the first dinnerware collections of “Rosenthal meets Versace”, launched in 1993, mirrors the matchless rich, colour intensive world of Versace. The emblematic Versace pattern featuring the glorious gold coloured central Medusa head has a new contemporary look. The new form lends excitement to this classic pattern. Gianni Versace chose this Greek mythological figure as his luxurious logo because she made people fall in love with her and they had no way back. He hoped his Maison would have the same seductive effect on people. The pulsating brilliance of the lively royal blue, the elegance of the black and the magnificence of the gold: a colour spectrum which dominates the extremely elegant and modern tableware collection and enshrines the sumptuous golden Medusa emblem in a deep blue sea. 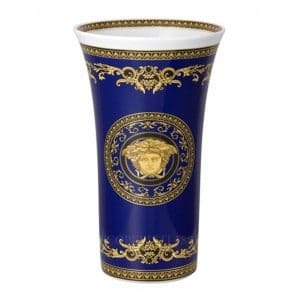 Medusa Blue one of the first dinnerware collections of "Rosenthal meets Versace” mirrors the matchless rich, colour intensive and refined world of Versace with a new contemporary look which lends excitement to the classic pattern. 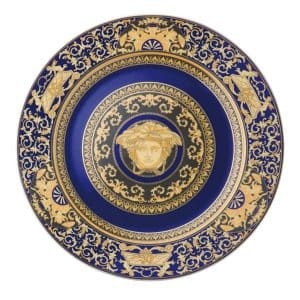 The pulsating brilliance of the lively royal blue, the elegance of the black and the magnificence of the gold: a colour spectrum which dominates the extremely elegant and modern tableware collection and enshrines the sumptuous golden Medusa emblem in a deep blue sea. According to ancient myths Medusa was one of the three Gorgons which in Greek mythology were sea monsters with gold wings, snakes for hair, and turned anyone who looked directly at them to stone. The three sisters represented perversion in its three individual forms: intellectual, sexual and moral. Medusa’s snake hair locks were a punishment from Athena. The once extremely beautiful mortal was punished by Athena with a hideous appearance and loathsome snakes for having been raped in Athena's temple by Poseidon. Gianni Versace chose this Greek mythological figure as his luxurious logo because she made people fall in love with her and they had no way back. He hoped his Maison would have the same seductive effect on people. Indeed the sumptuous Medusa head is the protagonist of many Versace collections in different rich colours and refined details making them unique and highly desirable among Versace cult followers The collection was Designed by Paul Wunderlich a German internationally known lithographic and object surrealist artist. His works are characterised by magic and mysticism and by the use of precious materials such as porcelain. Wunderlich had been working for Rosenthal since 1978. The Italian gifted designer immortalized the rich sea treasures of the god Neptune and of his tantalizing Calabrian Mediterranean marine world – shellfish, pearls, star fish and corals – in a turquoise sea among golden statues, baroque volutes, and frieze ornaments. The story behind is Ulysses’ sea voyage through the straits of Messina, tied to the ship’s mast in order to resist the bewitching singing of the mermaids. This collection is ideal for those who love luxury and want something slightly out of the common with a touch of the magic allure of bygone days. 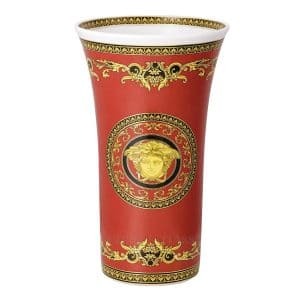 The cooperation between the German porcelain Rosenthal firm and Versace, started in 1993, and gave birth to the fascinating collection Les Trésors de la Mer. The Italian gifted designer immortalized the rich sea treasures of the god Neptune and of his tantalizing Calabrian Mediterranean marine world – shellfish, pearls, star fish and corals - in a turquoise sea among golden statues, baroque volutes, and frieze ornaments. The story behind is Ulysses’ sea voyage through the straits of Messina, tied to the ship’s mast in order to resist the bewitching singing of the mermaids. This collection is ideal for those who love luxury and want something slightly out of the common with a touch of the magic allure of bygone days. A palette of delicate shades of colour gives life to items of great taste which will enchant your guests and trigger new life in the exclusive world of designs. This imaginative dinner service, the epitome of elegance and refinement, was Designed by Paul Wunderlich a German internationally known lithographic and object surrealist artist. His works are characterised by magic and mysticism and by the use of precious materials such as porcelain. Wunderlich had been working for Rosenthal since 1978. Emblematic the gift box which recalls a little treasure box for your precious items. The charm of glamorous past epochs blends with the opulent Baroque print, urns, laurels and ornaments and the modern colours like mat black, red and accents of gold. The wonderful Medusa head icon is queen of the collection enshrined by neoclassic designs. According to ancient myths Medusa was one of the three Gorgons which in Greek mythology were sea monsters with gold wings, snakes for hair, and turned anyone who looked directly at them to stone. Highlighted by recurrent neoclassic symbols interchanging in geometric circle bands, this dinnerware collection brings a regal touch of style to the table. The charm of glamorous past epochs blends with the opulent Baroque print, urns, laurels and ornaments and the modern colours like mat black, red and accents of gold. The wonderful Medusa head icon is queen of the collection enshrined by neoclassic designs. According to ancient myths Medusa was one of the three Gorgons which in Greek mythology were sea monsters with gold wings, snakes for hair, and turned anyone who looked directly at them to stone. The three sisters represented perversion in its three individual forms: intellectual, sexual and moral. Medusa’s snake shaped hair locks were a punishment from Athena. The once extremely beautiful mortal was punished by Athena with a hideous appearance and loathsome snakes for having been raped in Athena's temple by Poseidon. Gianni Versace chose this Greek mythological figure as his luxurious logo because she made people fall in love with her and they had no way back. He hoped his Maison would have the same seductive effect on people. Highlighted by recurrent neoclassic symbols interchanging in geometric circle bands, this dinnerware collection brings a regal touch of style to the table. The charm of glamorous past epochs blends with the opulent Baroque print, urns, laurels and ornaments and the modern colours like mat black, red and accents of gold. The wonderful Medusa head icon is queen of the collection enshrined by neoclassic designs. According to ancient myths Medusa was one of the three Gorgons which in Greek mythology were sea monsters with gold wings, snakes for hair, and turned anyone who looked directly at them to stone. The three sisters represented perversion in its three individual forms: intellectual, sexual and moral. Medusa’s snake shaped hair locks were a punishment from Athena. The once extremely beautiful mortal was punished by Athena with a hideous appearance and loathsome snakes for having been raped in Athena's temple by Poseidon. Gianni Versace chose this Greek mythological figure as his luxurious logo because she made people fall in love with her and they had no way back He hoped his Maison would have the same seductive effect on people. The Vanity collection serves as a passe-partout to mix at one’s pleasure with any Versace Rosenthal dinner service. The matt sheen faux-uni effect of this well-known pattern has been achieved with a special golden titanium coating. 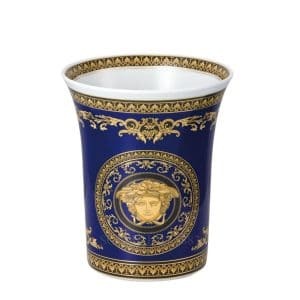 The brilliant golden Versace motifs flare up from the precious dark blue and deep black porcelain, where the shades are often difficult to distinguish, providing an elegant and delicate pattern that reinforces Versace’s Art de la Table and recalls the inlay work of the varnished Baroque furniture. Once again Versace wishes to recall the magnificent and coloured underwater world off the shores of his beloved Calabria. A fresh new take on the iconic “Les Trésors de la Mer” dinner set. The different refined designs and pleasing colour selections – shades of grey and ivory framed by vibrant orange and delicate brushes of pink and pale green – favour a detailed choice so as to better adorn one’s home and render unique all special moments. High quality German Rosenthal porcelain welcomes the fantasy sea world depicted by Versace, where shells, sea nymphs, sea snails and corals in brilliant colours rest on the white porcelain bed creating a variety of original patterns. Once again Versace wishes to recall the magnificent and coloured underwater world off the shores of his beloved Calabria. A fresh new take on the iconic “Les Trésors de la Mer” dinner set. The different refined designs and pleasing colour selections - shades of grey and ivory framed by vibrant orange and delicate brushes of pink and pale green - favour a detailed choice so as to better adorn one’s home and render unique all special moments. The dinner set is also available in a vivid pink. The story behind is Ulysses’ sea voyage through the straits of Messina, tied to the ship’s mast in order to resist the bewitching singing of the mermaids. This imaginative dinner service, the epitome of elegance and refinement, was Designed by Paul Wunderlich a German internationally known lithographic and object surrealist artist. His works are characterised by magic and mysticism and by the use of precious materials such as porcelain. Wunderlich had been working for Rosenthal since 1978. Emblematic the gift box which recalls a little treasure box for your precious items. This is a collection which plays with elegance, sophistication and simplicity. The brilliance and the timeless look, together with the satin finish of the Medusa emblem embellishes the articles of this line enhanced by a glamour which is typical of the Versace style. The high quality crystal glasses are subtly pervious to light, harmonising both with each other as well as with all other sets in the current “Rosenthal meets Versace” collection. This is a collection which plays with elegance, sophistication and simplicity. 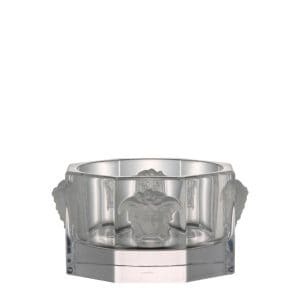 The brilliance and the timeless look, together with the satin finish of the Medusa emblem embellishes the articles of this line enhanced by a glamour which is typical of the Versace style. The high quality crystal glasses are subtly pervious to light, harmonising both with each other as well as with all other sets in the current “Rosenthal meets Versace” collection. The transparent medusa head and the long stem lend the glasses a certain elegance, imparting any cocktail reception and table setting with wonderful sparkling accents. The reflecting light will invade your houses guaranteeing an extra touch of class. According to ancient myths Medusa was one of the three Gorgons which in Greek mythology were sea monsters with gold wings, snakes for hair, and turned anyone who looked directly at them to stone. The three sisters represented perversion in its three individual forms: intellectual, sexual and moral. Medusa’s snake hair locks were a punishment from Athena. The once extremely beautiful mortal was punished by Athena with a hideous appearance and loathsome snakes for having been raped in Athena's temple by Poseidon. Gianni Versace chose this Greek mythological figure as his luxurious logo because she made people fall in love with her and they had no way back. He hoped his Maison would have the same seductive effect on people. The collection now offers a new version featuring a sophisticated dark grey colour fume, the new Medusa Lumiere Haze glassware. The ultimate in elegance and mystery. Le Jardin de Versace is an enchanting fairy tale garden, a romantic porcelain dream in soft pastel shades and an opulent diversity of blossoms, berries, ladybirds and butterflies that delicately rest on the golden intertwined branches. Recollection of the sumptuous gardens in Louis XVI style, the delicate turquoise and deep red, lots of gold, different shades of blue and green all lend the pattern a lightness of being that evokes springtime joyful feelings perfectly. Gianni Versace's artistic influence in the world of fashion was virtually unparalleled. His legacy can now be experienced also in home decòr owing to its marriage with Rosenthal high quality porcelain. Versace by Rosenthal is an extraordinary collection resulting in high quality tableware and giftware in contemporary designs. Le Jardin de Versace is an enchanting fairy tale garden, a romantic porcelain dream in soft pastel shades and an opulent diversity of blossoms, berries, ladybirds and butterflies that delicately rest on the golden intertwined branches. Recollection of the sumptuous gardens in Louis XVI style, the delicate turquoise and deep red, lots of gold, different shades of blue and green all lend the pattern a lightness of being that evokes springtime joyful feelings perfectly. The ornaments hand painted with fine golden accents combine to playfully symbolize a perfect summer symphony and create a perfect harmony that has the power to enchant. Each collection piece has its own individual character. There are plates where the butterfly dominates at the centre of a golden twine resting on a pastel shade pink; there are also smaller plates, ideal as wedding favours, where the golden branches border giving greater emphasis to the coloured butterflies which flutter over the sky blue centre. 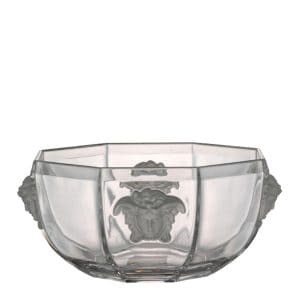 This glamorous Oriental glassware design harmoniously interplays with opulent and refined transparencies featuring magnificent and impressive branches of acanthus leaves topped by Greek freezes. The crystal collection, a true expression of the pure love of life, includes giftware in the form of vases, coasters and square dishes and bowls to simply display or use with their soft lines and full bodies. This glamorous Oriental glassware design harmoniously interplays with opulent and refined transparencies featuring magnificent and impressive branches of acanthus leaves topped by Greek freezes. The crystal collection, a true expression of the pure love of life, includes giftware in the form of vases, coasters and square dishes and bowls to simply display or use with their soft lines and full bodies. The crystal range complements classically decorated and contemporary styled homes and ideally combines with tableware from the Arabesque Gold ranges and the Arabesque amber or crystal clear wine glass collections. Often seen in stately homes and present at formal occasions such as grand balls, galas and dinner parties, the crystal glassware has become heavily associated with grandeur and elegance and never disappoints. The dazzling lights which reflect in the crystal will overwhelm your homes with magnificent luxury. The baroque aesthetics and the Versace’s luxurious richness of the Medusa Gala decòr enriches even further the glamorous Rosenthal Versace collections dedicated to the mythological creature. The Medusa becomes extremely elegant and refined against the dazzling white porcelain background enveloped by the gilded filigree and intricate baroque ornaments. The Les Reves Byzantins decòr expresses the re-discovery of an exotic-oriental atmosphere which blends symbols of Middle Eastern art with the Versace classic baroque motifs and iconic symbols of medieval art. This pattern designed by Donatella Versace guides us directly to Istanbul, ancient Byzantium, the gateway between East and West, enabling us to dream the mythical worlds of Arabian Nights. The Les Reves Byzantins decòr expresses the re-discovery of an exotic-oriental atmosphere which blends symbols of Middle Eastern art with the Versace classic baroque motifs and iconic symbols of medieval art. This pattern designed by Donatella Versace guides us directly to Istanbul, ancient Byzantium, the gateway between East and West, enabling us to dream the mythical worlds of Arabian Nights. The vivid pink highlights the female character and enhances the brilliance of the collection with its numerous golden leaves, crescent moons and braidings. Versace “Les Reves Byzantins” Coffee Pot by Rosenthal. At Italian weddings a bonboniere is the traditional gift given by the bridal couple to their invited guests. 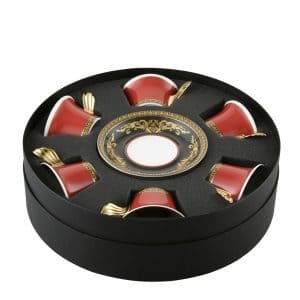 Packaged in intricately ornamented boxes, the bonboniere generally contains useful little objects made from porcelain, crystal, silver or fabric. This little courtesy is by means of thank you to the guests and should serve as a reminder of the wedding reception and the bridal couple. For this reason, picture frames, dishes, ash trays, candlesticks and trinket boxes are particularly popular as bonboniere gifts. 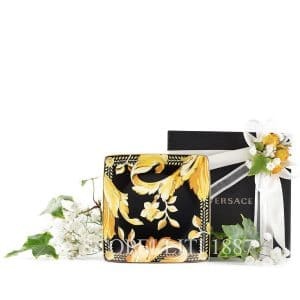 Versace offers a lot of different round and square dishes in fantastic luxury pattern.